The Bahrain winning Porsche 919 Hybrid driven by Romain Dumas, Neel Jani and Marc Lieb. Porsche works drivers closed-out the 2015 FIA World Endurance Championship Saturday by claiming drivers’ championships in the Le Mans Prototype 1 and GTE-Pro classes during the Six Hours of Bahrain. A fifth-place finish by Timo Bernhard of Germany, Brendon Hartley of New Zealand and Mark Webber of Australia in the No. 17 Porsche 919 Hybrid was enough to claim the LMP1 drivers’ title in Round 8 of the series. Romain Dumas of France, Neel Jani of Switzerland and Marc Lieb of Germany posted their first win of the season in the sister No. 18 Porsche 919 Hybrid. Meanwhile, the Porsche 911 RSR co-driven by Frenchmen Frédéric Makowiecki and Patrick Pilet scored its fourth GTE-Pro class win of the season, as Porsche also netted three championships with the racer based on the iconic 911 sports car. 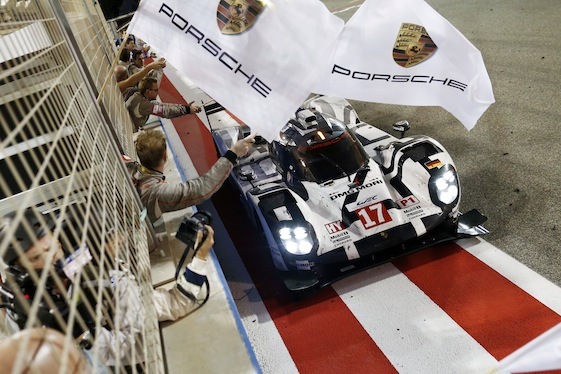 With this victory at the Bahrain International Circuit, Porsche overtook Ferarri in the manufacturers’ classification. The Porsche Manthey squad secured the team championship, and Porsche works driver Richard Lietz of Austria defended his title in the FIA World Endurance Cup for Drivers. Bernhard/Hartley/Webber began the day with a 13-point lead over the Audi trio of Marcel Fässler, André Lotterer and Benoît Tréluyer. But the race took an unexpected turn 30 minutes after the start when Bernhard reported a loss of engine power and was forced to pit. Team mechanics repaired an engine actuator problem in 8 minutes, 43 seconds _ dropping Bernhard four-and-a-half laps off the lead around the 3.362-mile circuit in Sakhir. Eighty-three laps into the event _ 79 for his car _ Hartley pitted for fuel and tires and a second stint. Hartley handed the car over to Webber at the end of Lap 114 (Lap 110 for the No. 17) in fifth. Webber pitted for fuel and fresh tires after 144 laps. After Lap 158, Webber was called in for another unscheduled pit stop involving an actuator problem but rejoined the race without losing a position. Following a final splash-and-dash for fuel after Lap 183, Webber crossed the line in fifth _ but as a world champion. “Today clearly shows the qualities of the team,” Webber said. “We have had some very smooth days this year, but we executed the victories with clinical precision. Today was about fighting as hard as possible. You saw the spirit of the mechanics; you saw the spirit of the drivers. I cannot thank the mechanics enough. The pit stops we had in the garage were extremely stressful. It’s amazing that we were able to win the world championship under pressure like this. The season was highlighted on June 14, when Earl Bamber of New Zealand, Nico Hulkenberg of Germany and Nick Tandy of Great Britain co-drove the No. 19 Porsche 919 Hybrid to victory in the 24 Hours of Le Mans. Porsche’s record 17th overall victory in the world’s most prestigious endurance race was capped by a 1-2 finish as Bernhard/Hartley/Webber finished second for a fifth time, a list including 1971, 1983, 1987 and 1998. 1. Porsche, 344; 2. Audi, 264; 3. Toyota, 164. 1. Porsche, 290; 2. Ferrari, 286; 3. Aston Martin, 192. Note: Sports Prototypes and GT vehicles contest the Sports Car World Championship WEC (World Endurance Championship) in four classes _ LMP1 (eg. Porsche 919 Hybrid), LMP2, LMGTE-Pro (eg. 911 RSR) and LMGTE-Am (eg. 911 RSR, 2014 homologation). All entries compete together in one race but are classified separately.